"So sorry for your loss. May you family draw comfort in..."
"Joan and I were together on March 30, 2019...not April 30,..."
"So sorry for your loss Sally-Ann and Tim. She will be..."
"Sally, sorry for your loss may she rest in peace." "Sally-Ann, We are so sorry to hear of your mother's..."
SKOWHEGAN - Joan L. Merrow Dudley, 84, passed away on Monday, April 8, 2019, at Cedar Ridge Center in Skowhegan. 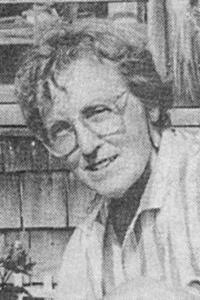 She was born in Skowhegan on Oct. 7, 1934, the daughter of the late Leroy and Ruth (Sirois) Merrow.Joan worked many jobs including working as a CNA at Cedar Ridge Center, second sleeving at Hathaway Shirt Co., and Solon Manufacturing. Her greatest job was gardening and selling her Hostas out by the road when she lived on Quaker Lane in Smithfield, Faye Street in Belfast, and Perennial Drive in Skowhegan. It brought her great joy knowing that her Hostas were going to "Plant their feet" in areas all over Maine.Joan enjoyed kayaking, cross country skiing, and riding her "bike" scooter. She was very talented in crafts, making pin cushion dolls, crocheting angels, snowflakes, doilies, and afghans.Besides her parents, she was predeceased by her two brothers, Bruce and Stanley; and her two sons, Bruce and John Dudley.Joan is survived by her son, Timothy Dudley and his wife Louise, her daughter Sallyann Knights and her husband Michael; her six granddaughters, Melissa Gribben, Tracy Moody, Amy Thornton, Kelly Dennis, Denise Crosby, and Meagan Shaw; and her six great-grandchildren, Trevor, Owen, Juliette, Wyatt, Lincoln, and Lucas.The family would like to thank everyone at Cedar Ridge Center for the wonderful care given to her for the past five years. An extra special thank you to her "favorite", Robin.A celebration of Joan's life will be held from 11a.m. to 2 p.m. on Saturday, April 13, at Smithfield Fairview Grange, 826 Village Rd. in Smithfield. All are welcome!An online guestbook may be signed, and memories shared at www.familyfirstfuneralhomes.comArrangements are by Wheeler Funeral Home & Cremation Care, 26 Church St., Oakland.